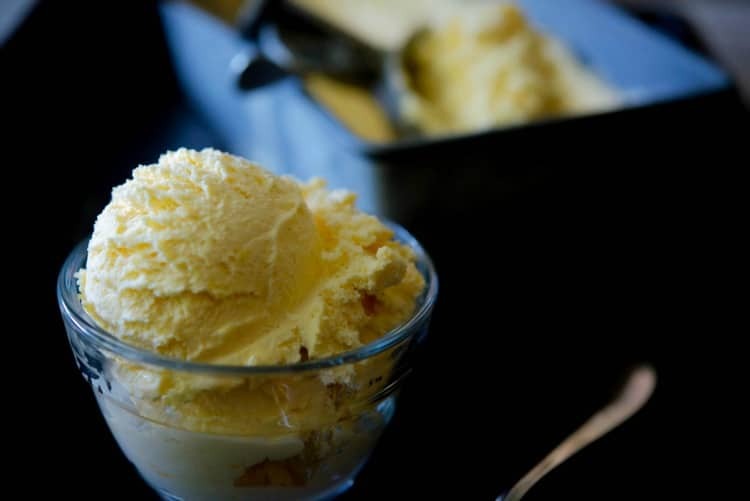 Homemade Mango Ice Cream made with sweet mangoes, heavy cream, milk, sugar and vanilla makes the perfect summertime frozen treat. 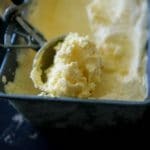 If you or your family are anything like mine they are going to LOVE this homemade Mango Ice Cream made with simple, easy to pronounce, wholesome ingredients. My family is obsessed with mangoes. Seriously, they can’t get enough whether they eat them by themselves or I make a recipe with them like Mango Salsa, Stacked Heirloom Tomatoes & Mangoes with Balsamic Reduction or Tropical Corn Salad. 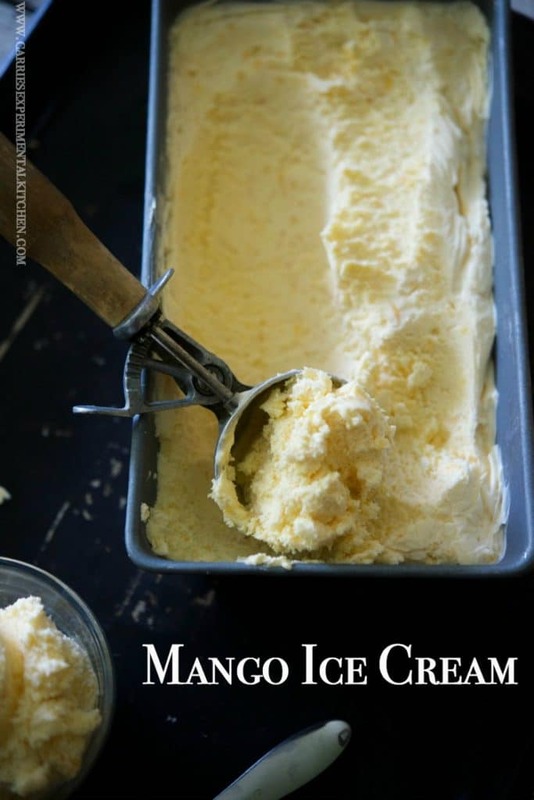 But I think they’re absolute favorite way to eat mangoes is in Mango Ice Cream; which I usually purchase, but wanted to make my own homemade version. 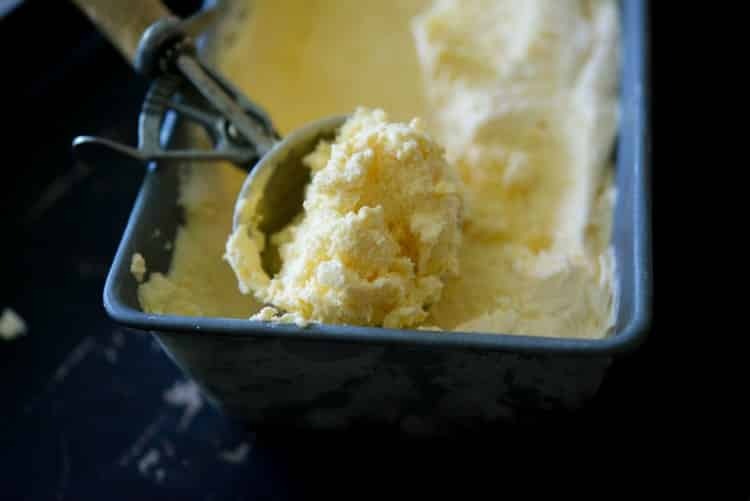 Making your own ice cream is easy, especially if you have own an ice cream maker and being that Summer is almost here, I broke mine out of storage to make a new flavor; especially since my youngest has been asking me for weeks. For this recipe I used defrosted frozen mangoes, milk, heavy cream, sugar and vanilla. First, I combined the sugar and milk together in a bowl and used an electric mixer to blend it together until the sugar dissolved. Next, I added the mangoes to a mini food processor and pulsed until the mangoes were chopped fine, but not completely pureed; then added them to the bowl of milk and sugar. Finally, I added the remaining ingredients and mixed together with a spoon. It only takes about 10 minutes to do the initial prep; then add the mixture to your ice cream maker and churn for 30 minutes. Place the ice cream in a container and cover. I used a loaf pan and covered it with plastic wrap for this recipe, but you can also use a plastic container with lid. Freeze for at least 2 hours and serve. My family really loved this homemade recipe for Mango Ice Cream and couldn’t get enough of it. It was rich, creamy and delicious. I hope your family enjoys it as much as mine did. Combine the sugar and milk together in a bowl and use an electric mixer to blend it together until the sugar dissolved. Next, I add the mangoes to a mini food processor and pulse until the mangoes are chopped fine, but not completely pureed; then added them to the bowl of milk and sugar. Add the remaining ingredients to the bowl; mix with a spoon; then add the mixture to your ice cream maker and churn for 30 minutes. What is your favorite way to eat mangoes? I love mangos anyway I can get them from fresh to Trader Joe’s dried with chili powder to mango sorbet!